Caption slip reads: "Photographer: Sandusky. Date: 1958-01-12. Assignment: Ancient "Hangman's Tree" falls. 33-34: Mrs. Ruth Hulsman & daughter Sunny saw branch off fallen tree to clear driveway as other daughter, Gaye, watches. 29- L to R: Sunny & Gaye Hulsman on tree. 48: Mrs. Robert Caldwell trims small branches from tree. 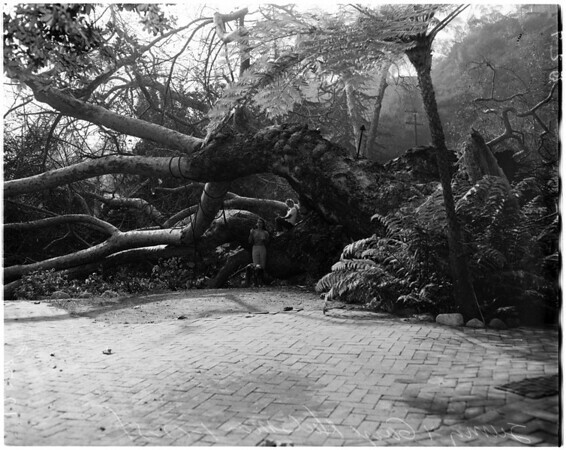 27-28-30-47: General views of kids on fallen tree, taking pictures of tree, people watching as others clear debris".